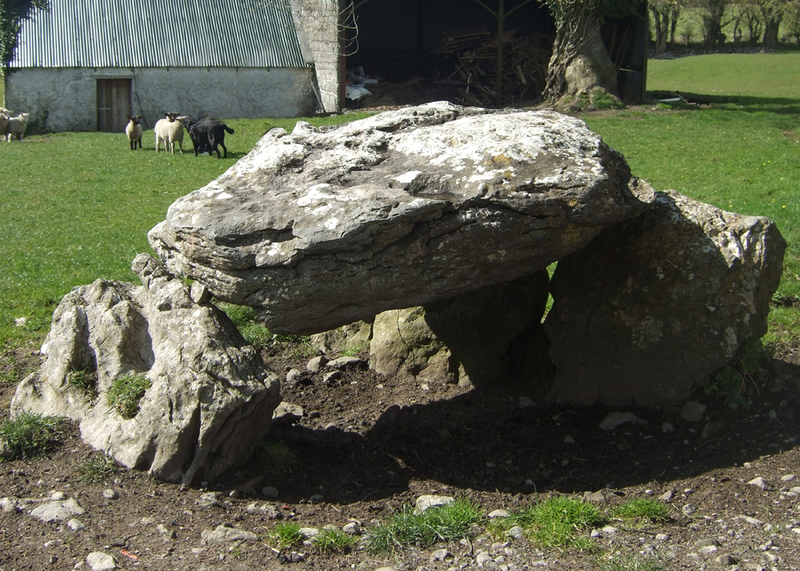 This small wedge tomb is located east of the Killaclogher River just off the R339, NE of the town of Monivea, ‘Muine Mhea’, in the side garden of a farmhouse. We are fortunate to have a Wedge Tomb in our Parish and this is the Kilbeg Wedge tomb situated in Higgins’s field at Kilbeg. It is located just to the left following the turn at Killaclogher Bridge for Corrandoo/Tiaquin/Gurteen. The Higgins family bungalow is located beside the tomb. This small wedge tomb is located east of the Killaclogher River just off the R339, NE of the town of Monivea, ‘Muine Mhea’, in the side garden of a farmhouse. 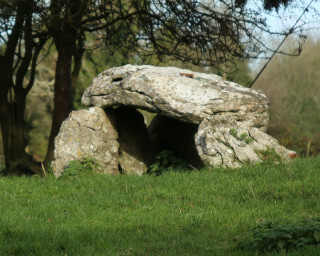 The tomb, orientated NE – SW, consists of a small chamber covered in a sub-rectangular roof-stone measuring 2m in length, 1.1m in width and 0.40m in depth. 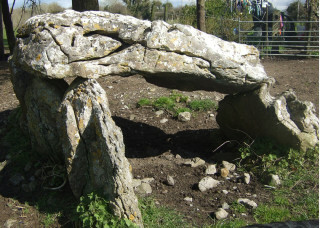 It is supported by three small side-stones on the north side and a single side-stone on the south side. The entire structure is sited on a narrow plateau, which falls off gently to the SW. 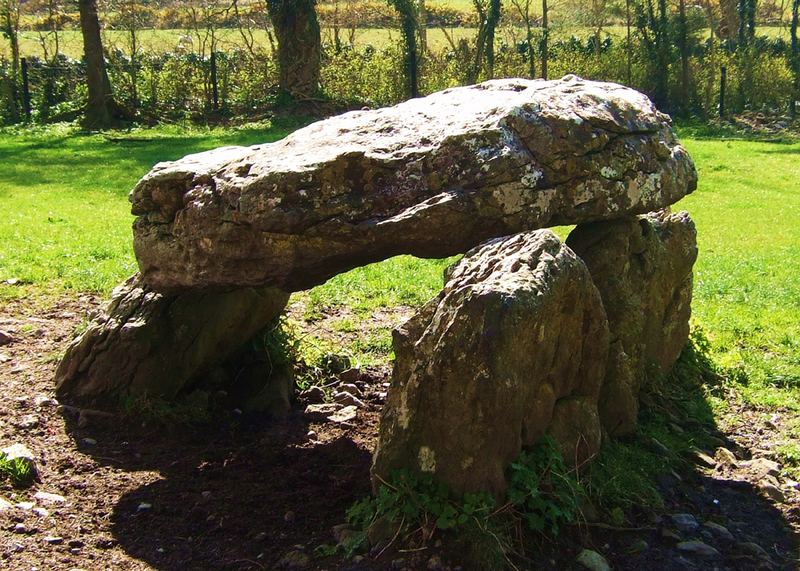 Archaeologists believe that most were built between before and during the Bronze Age from 4,000 to 2,300 years ago, possibly built by settlers from France who may have been the first of the groups who would become known as the Celts. Wedge Tombs consist of a narrowing stone chamber covered by a mound of earth. The single entrance almost invariably faces south-west. Researchers and Archaeologists have also discovered that ritual practices took place at various times of the year, with many of the monuments carefully positioned by their builders to take into consideration the surrounding landscape as well as the sunrise, sunset, lunar position and the location of rivers and springs deemed sacred by the people of that time. Today, many of these outstanding monuments are still with us, and it is a legacy we can be very proud of and a history and heritage we must continue to treasure and preserve.